Buy The Witcher 3 Wild Hunt GOTY cd key in digital version for PC at the best price is already possible thanks to Gocdkeys! You can preorder The Witcher 3 Wild Hunt GOTY for GOG or Steam in some of the online shops registered in our price comparison. Currently there are two download methods for this game, one through the GoG shop, where you must create an account to download the game and another method through Steam games platform, adding the cd key in your account user. 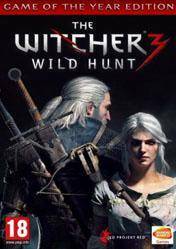 The Witcher 3 Wild Hunt is the last delivery of one of the largest and most impressive RPG, and now comes the "Game of the Year" which includes the original game and all DLC, expansion packs or Bonus have been released to date. A deluxe edition to enjoy the whole experience The Witcher at a really great price. We embody the hunter of beasts and witcher Geralt of Rivia in a huge adventure full of monsters of all kinds, sword and sorcery, in a huge fantasy world recreated with all kinds of details. If you're looking for a RPG where you lose hundreds of hours with missions of all kinds, magic and monsters, this game is what you are looking for. Do not forget to check all the information in each store on methods of payment and download methods, as Gocdkeys not responsible for any problems that may arise, although we have a support email from our contact section. Looks like an awesome game. heard many great things about it. The graphics are awesome but first i gonna try here on the lottery, who knows if i might win something. approuve and in love with it, my best game at this day. For me, it's the game of the year. I hope a new TW will be product. I would like a steam version but got a Gog version, but thats good i can play. This is by far the best game ever yet. Even played with cheat codes, command console, or anything like that. The fun will always be there! I play this game since last year, and there is so many thing to do, that I haven't finished it yet. And I play almost everyday. I'm just doing every contract and secondary missions, before doing the main Mission. There is many allusion to other story from similar universe, like GoT, Grimm's tales, even Jesus Christ! This is an investment you won't regret!